Beautifully engraved certificate from the Howe Rubber Corporation - Delaware 1919X This historic document was printed by the American Banknote Company and has an ornate border around it with a vignette of an eagle. This item has the signatures of the Company’s President and Secretary. 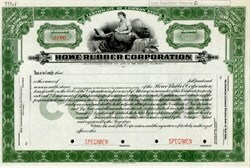 The Howe Rubber Corporation was incorporated on October 10, 1919, in Delaware, as successor to Howe Rubber Co. of New Jersey, incorporated in 1905. In 1911, the company disposed of its other lines to concentrate upon the manufacture of inner tubes for automobile tires. The company manufactured the Howe red tube, automobile tires and accessories. The plant, located in New Brunswick, N. J., was situated on over five acres of land and had a floor space of 76,000 sq. ft., employed about 500 men. In 1919, the company produced 3,000 tubes and 200 tires per day; 1920, 725 tubes and 152 tires per day.